While hearing aids can be helpful for most individuals, there are some who find limited benefits from acoustic amplification. 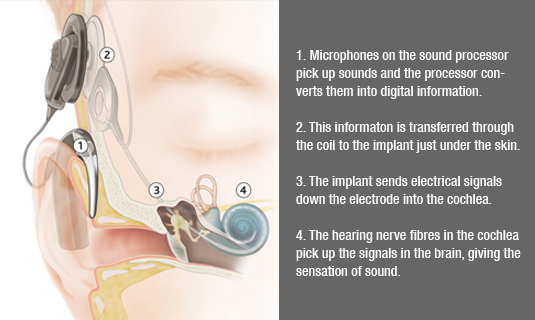 The cochlear implant is an established treatment for severe to profound hearing loss as it bypasses the damaged structures of the inner ear and directly stimulates the auditory nerve. For children, early intervention is important to help them listen and access sounds for speech and language development. Rehabilitation and therapy will help the child make use of new sounds that the cochlear implants provide.